Our thirty-eighth exhibit provided a look into the different techniques and mediums five artists use to capture landscapes. Fort Myers’ Greg Biolchini returned to the gallery with his most recent paintings, images that capture the grandeur and majesty of our Florida Skies and leave us touched by their beauty and amazed by his ability. Karen Glaser (of Chicago and Gainesville) contributed her astonishing underwater images of the Florida Everglades and swamps; Glaser's work was the first photography to be showcased in the gallery. Cuban-born Alejandro Mendoza is a classically trained Miami-based sculptor whose abstract wall sculptures and surreal drawings are about home. Sondra Dorn (of Asheville, NC) creates mixed media pieces that include photography, paint, fabric and wax, the combination of which produces imagery that is textured and otherworldly. Marianne van Lent (of NYC and Upstate NY) creates “old world,” abstract landscapes using fresco secco, a technique used since the 8th century. 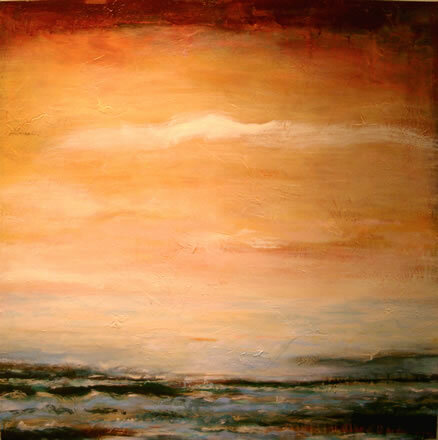 On canvas, her work captures the light and feel of the places she loves.